Likewise, during the “talk back” after each of the performances, some audience members express anger at the character of Tami, the mother who insists that her son remain at home. They ask, “How can she keep this boy in the house?” to which Jent replies, “As if there's any place else for him to go? It's so complicated and messy; if there was an easy answer, people would have figured it out a long time ago.” Many in “Falling” audiences can empathize with the daunting challenge of finding appropriate housing for adults with autism. Recently, Autism After 16 spoke with Jent about the creation of “Falling,” and what the play has to say to the autism community and the world. "Fallling," was developed at Mustard Seed Theatre and won the 2012 Kevin Kline Award for Best New Play. AA16: First, could you give a quick overview of the plot of “Falling” for those who may not be familiar with it? DJ: “Falling” is a day in the life of a "typical" family who are caring for a teenage son [Josh] with severe autism. It's typical for them, that is. The first scene is morning routines, things like getting on the bus, getting the day started. In that scene, we learn that the dad's mom, Grammy Sue, is coming to visit for a week, and she's not been there for about three years [since before Josh's aggression and self-injurious behaviors began]. She doesn't know this Josh. She comes in the second scene, and her being there, as well as other things that happen, all throw Josh off of his schedule, and so he becomes aggressive. The family struggles to cope with Josh's behavior; in fact, the husband, Bill, says if [Josh] has to stay, he doesn't know if he could stay, too; the marriage might be over. And in the end, the mom, Tami, realizes that she has got to let go of the dream of what Josh's life might have been in order for life to go on. She's stuck in this mode of hanging on to that, and she's got to let it go. There's no happy ending, but I think there is hope that, in recognizing the reality and grieving what we need to grieve, then we can move on. AA16: What prompted you to write “Falling”? DJ: I have written all my life, lots of bad poetry, and some short stories too. 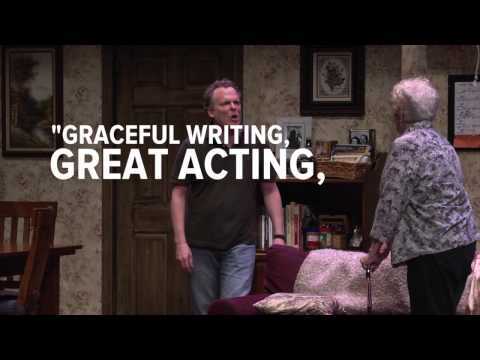 I had some nonfiction essays published, some theater reviews … writing is how I process the world. And after the very difficult summer, the one in which [my family and I] were looking for placement [for my son] and felt like we were in a war zone every day, when he got back to school I started writing about it. I wrote scenes; I wrote down what had happened. I didn't know if it was therapeutic, or what. So I took [what I had written] to a colleague who is a poet, and I asked him, “What am I doing here?” And he said, “I think this needs to be a play.” And I said, “Well, this can't be a play, it's my life!” But he challenged me to think, “What if?” And I took the challenge. I decided that what I wanted to do was to somehow create in the audience the experience of having the floor drop out of your world. It's the experience I've had when, for example, I'm walking into a faculty meeting and I get a phone call and it's the police, saying, you have to come and pick [your son] up, because he attacked somebody on the bus today. Every day, I ask, “Is this gonna be a good day?” [Living with my son's behavior] means walking on eggshells, being on alert. Even when there's a “cease fire,” it's still a war zone. And we're taking the audience on the ride with us through this day. AA16: Do you have a favorite line or scene from the play? One of the responses I received to the show was that, as one person said, "The problem with this show is that everybody's right. It's easier if everybody's wrong." The grandma's not “wrong” in praying for a miracle. And the daughter isn't “wrong” either; in fact, she's the voice of reason in that house. Even Josh, given the constraints of his world, isn't “wrong.” To express himself physically is all he can do in that moment in time. He's so sad about it after it's over, but it's like he can't help himself. AA16: How involved were you in the two productions of the play? Did you participate in the casting process? DJ: I was involved in both the St. Louis production and the New York production, Lori [Adams, the director] was primary in terms of casting, but I was there through the auditions for both shows. Likewise, in New York, producer Terry Schnuck did the casting; it was his choice, but he was interested in our input. And as it happened, we were all in agreement about casting. AA16: Did conflicts ever arise during the production, due to the physical and emotional difficulty associated with the storyline? DJ: All of the actors really embraced the challenge head on. The actor playing Josh immediately immersed himself in [questions like], What does this look like in the world? I showed him videos of my son, and he did a lot of research on the physical manifestation of aggression. But the key for him was asking, “What's going on this character's head? If I was a person fascinated by visual stimulation, and I didn't have a lot of words, and I lived moment by moment just reacting to things, what would I do?” He put himself into the character. And the aggression sequences were completely choreographed and safe, thanks to Rick Sordelet, our movement and fight director and choreographer. He had us do [the sequences] in slow motion, then speed it up. There are some amazing theater tricks; it looks so dangerous, but it's really very safe. I also had time to do a mini-lesson in behavior management techniques with the actors in both productions, because all of those techniques influence the way the characters speak. That behavioral focus on life influences everything you do. For example, they understand why, when they see Josh touching himself, his dad immediately says, "Hands up! Clap hands." AA16: What has been the most challenging part of the production process for you personally? DJ: Reliving the journey with the actors is … well, I know the show, I know what's coming, but still, when it gets to the “loss of the dream” moment for the mom, that's a really raw moment for everybody in the audience. But whatever the challenge of going through that emotional journey is, it is completely countered by the joy of sharing this story and of telling this truth. Because this isn't something they'd show on “Night of Too Many Stars.” This is not the wonderful girl who sings with Katy Perry. This is the flip side of that. I don't think [“Falling”] is gonna be a Broadway blockbuster, but for those people who see it and see their story being told truthfully, that's the joy for me. Because we feel like we're alone [when we're dealing with situations of aggression and self-injury]. We can't have friends over. Once, someone at work said, “Hey, how's your day?” and I said, “It's a good day, I haven't been punched in the face.” The other person thought I was kidding, but I was serious. But then there might be many days in which [my son] is this happy, loving, hilarious person to be around. But the aggressive stuff, at least in the moment [when it occurs], trumps that. AA16: In the play, what's the younger sister's biggest challenge? What's the toughest thing for her about having a sibling with such severe autism and behavioral difficulties? DJ: The sister's biggest challenge is the love triangle, wherein she loves her parents; she knows her parents love her; she hates her brother, but she knows her parents love her brother. She's feeling like she can't honestly express what she feels or what she wants, and on top of that, she's a teenager. She's 16. At 16, of course you want to fit in with your friends. Of course you want your parents to come to all of your school events. But then she comes home to life in this house, and what that does to the family life. AA16: How is your son, Andy, doing today? What are some of your hopes for him and his future? DJ: He's 18 now, and about a year ago his neurologist adjusted some medications, which really helped to get rid of a lot of the aggressive and self-injury. We went from a semester of school with two or three aggressive incidents a week, to two or three aggressive incidents in the entire semester. It was amazing. It also helps that he's 18, and moving out of the throes of the hormonal imbalances. AA16: Any final reflections on the play, or thoughts to share with AA16 readers? DJ: The thing that I've realized is that, even though I wrote a play about a very specific family, the play is really about loving someone who's hard to love. And that's a universal thing; we all have that in our families somewhere. It might be us! Whether it's a personality thing or illness or addiction or aging, it's about how we handle the situations of caring for and loving someone who's hard to love. That's a crisis that I think everyone's heart can empathize with. And the theater can bring us all together and tell us stories that show us we're not alone.